The Barents Spektakel is a cultural-political cocktail with contemporary art and music, theatre and performance, architecture and literature and seminars and debates as its ingredients – all spiced with current issues related to the Barents Region and the High North in general. The festival started in 2004 and in February 2017 will transform Kirkenes into a Barents Metropolis for the 13th time. 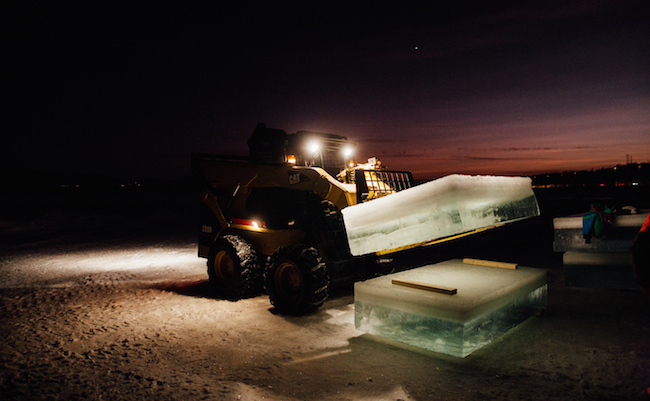 With the theme The Industrial Boomerang, the 2017 Barents Spektakel focuses on the new wave of industrialisation emerging throughout the arctic borderlands. With maritime and land-based industrial infrastructure expanding on both sides of the Russian-Norwegian border governments are creating new facilities or renewing their existing infrastructure. Kirkenes is aiming to become the central maritime transport hub in the Barents Region while the port of Murmansk is investing heavily to improve existing facilities. In Sør-Varanger, the mine has reopened with the goal of smaller scale, more efficient production of iron-ore, while on the Russian side, the smelters and mines on the Kola peninsula are increasing production on broad scale. With the neo-industrialization in the Arctic comes increased environmental and social awareness. Industrialists, investors, protestors and politicians all lay claim to high standards of safety and sustainability. Safeguarding operations in Arctic waters and across the tundra is the new moral code for this industrial renaissance. Is this re-industrialisation of Barents in line with re-globalisation of the world? The opening show that activates the giant blue crane – the 90’s icon of new Kirkenes and a symbol of industrial paradoxes. The crane will be occupied by the dancers of BANDALOOP from California – pioneers in vertical performance. Prepare for an awe-inspiring performance as dancers suspend from the 50-meter crane above the industrial docks in a dynamic choreographic exploration under the artistic direction of Amelia Rudolph. The powerful aerial dance with the crane will be augmented by live sound landscapes of FROST - an electronic duo from Tromsø featuring Per Martinsen and Aggie Peterson who will add an intricate industrial musical touch to the show. The Barents Spektakel 2017 will be officially opened be the formerPrime-ministerofFinland, PaavoLipponenand Minister of Foreign Affairs of Norway, Børge Brende. The industrial aesthetic continues into the opening concert – SOUND LANDSCAPES – directed by Peter Aidu and Moscow Theatre “School of Dramatic Art”. In the Soviet years, industrial and noise music became the standard-bearer for the proletarian future, where heavy machinery was the epitome of a new social order and harmonious industrialisation. Many of these experiments became part of the sound and stage design of Soviet avant-garde theatre and film. With the advent of recording technology, these experiments were totally forgotten. Peter Aidu and his Music Laboratory have reconstructed some of the mechanical noise machines whilst also creating new ones. The result is a mysterious symphony “Sound Landscapes” in four acts: “Landscape № 1”, “Indu strialisation”, “Landscape № 2” and ”Dies Irae”. In 2016, the performance won the prestigious “Golden Mask” award in Russia. The temperature will rise when Morten Traavik invites citizens of Kirkenes, Finnmark, Norway, the Barents Region and the world as both Judge and Jury to THE TRIAL OF THE CENTURY. Following the principles of a living hypertheatre, Traavik.Info prepares an alternative staging of the ground-breaking lawsuit where Norwegian environmental organisations Greenpeace and Nature and Youth are suing the Norwegian Government, alleging that it is allowing unconstitutional oil exploration in the Barents Sea. The staging will take place in the very heart of the region most directly affected by the developments. It will take the form of a People’s Tribunal located in an arena designed and constructed by the ice-artist, Peder Istad. The “ice court” is the largest ice sculpture ever made in Norway, and perhaps Scandinavia. The People’s Tribunal may also serve as a general rehearsal for the actual court case later this year. Through artistic reflections, the festival exhibition encapsulates the spirit of re-industrialisation of the north; its trends, along with its opportunities and consequences. From a physical salon-spa where Error collective (Helsinki) will transform your hair, to a virtual-spa by New Mineral Collective (Tromsø) where your body will experience how the earth encounters acupuncture caused by mining activities. From a temporary pop-up radio station devoted to the Barents maritime industry and culture by Nabil Ahmed and Dámaso Randulfe (London), to the last attempt to bring life to the Seaman’s Club that was once the heart of the Russian sailors’ milieu in Kirkenes – transformed by Sever7 (St Petersburg) into a mystical Flying Bar. From the raw leather weaves of Marius Moldvær (Oslo) that reflect what the people and communities of the Barents Sea coast live and breath, to the web- app and game created by eeefff (Moscow) where youth can sell their future goals and plans in the form of ‘tradable futures’ on the darknet. These projects draw together concepts of the industry that have brought prosperity to the north - in present, past and future tense. Debates during the series of Transborder Cafès will develop around themes that include – the status of the migration crisis in Europe and management of the refugee flows in the Middle East, national, industrial and data security, and to crown it all; the Northern Assembly – a new democratic arena for the North: politics, opera, vodka, voting and a brand-new Barents Anthem, directed by Amund S. Sveen. In the town square, there will be mass gymnastics during the festival days with festival artists as instructors (Morten Traavik/ Polar Biomechanics, Liv Hanne Haugen/ the Northern Assembly, etc.). The guitar pendulum, designed by The Megaphonic Thrift, invites all visitors to explore and interact with this sound installation in and set it in motion. The concert program includes; the not exactly Nordic poetic folk rock band Ljodahått, Russian avant-garde revisited with Glintshake (Moscow), indie and poppy-synth signature of The Megaphonic Thrift+ (Bergen), romantic alcho-jazz of Billy’s Band (St Petersburg), ferocious live beats and arena rock aesthetics of Ralph Myerz and the Jack Herren Band (with The Herren Horns), and the family-friendly pool party with The Wooden Whales (Murmansk) and Inge Bremnes (Kvæfjord). Prepare for a festival journey from the industrial wharf and harbourside club, to the Russian Market on the Town Square and the ice-court arena in the park; from the mountain cave transformed into concert hall to the vault of a disused bank and from outdoor winter chill to the warm poolside concert. Pack your warm Russian valenki next to your colourful bikini, your industrial helmet with your fur hat, your VR glasses with your internet radio headphones, your Judges robes with your fur coat and stuff your pockets with plenty of krones, roubles and cryptocurrency.